By the time Easton Hospital officially opened its doors on November 20th, 1890, the 11-bed facility had five attending physicians, four consulting physicians and one nurse on staff. It offered perhaps the most comprehensive medical attention available in the Lehigh Valley at the time. This November, Easton Hospital is celebrating its 125th anniversary. In honor of this historic milestone, we look at how the hospital has led the way in a number of significant areas. At the turn of the 20th Century, many hospitals refused to take cancer patients because of the erroneous belief that the illness was both incurable and contagious. Easton Hospital, however, took the opposite approach. … it offered perhaps the most comprehensive medical attention available in the Lehigh Valley at the time. In 1904 the hospital became the first in the nation to report its tumor cases separately from other types of diseases. This list eventually evolved into the nation’s first tumor/cancer registry, which is vitally important in helping public healthcare officials understand and address the cancer burden. Today, Easton Hospital is a Fox Chase Cancer Center Partner and offers the city’s only 3-D mammography. Ongoing upgrades to its Cancer Center continue this fall and will include a new $3.5 million Infusion Center and the purchase of $1.4 million in new equipment. The hospital’s ongoing commitment to the people it serves is today evidenced through its charitable actions. Last year alone, Easton Hospital provided more than $7.4 million in charity and uncompensated health care to the area’s most in-need residents. It paid $16 million in taxes that support the local civic resources, and also donated more than $150,000 to organizations and community causes, such as ProJect of Easton, Easton Area School District, Easton Area Community Center, the Easton Farmers’ Market and the State Theatre. In 1900, Easton Hospital established its School of Nursing as a one-year training program. This quickly developed into a three-year school that, by the 1960s, was ranked 30th out of 106 in the state of Pennsylvania. To help further enhance their teaching programs, the hospital also established a residency affiliation with New York University in 1945. Although the nursing school closed in 1975, Easton Hospital today maintains an internal medicine and surgery residency program with Drexel University. Two years after opening in 1890, Easton Hospital expanded its facility to include an operating room, a surgical ward, a receiving ward and one private room. By 1895 more than 450 patients had come through its doors. To meet the growing needs of the community, the hospital moved to its current location in Wilson Borough in 1930. There, it added new wings in 1950, 1964 and 1977, and new units in 1973, 1975 and 1976. 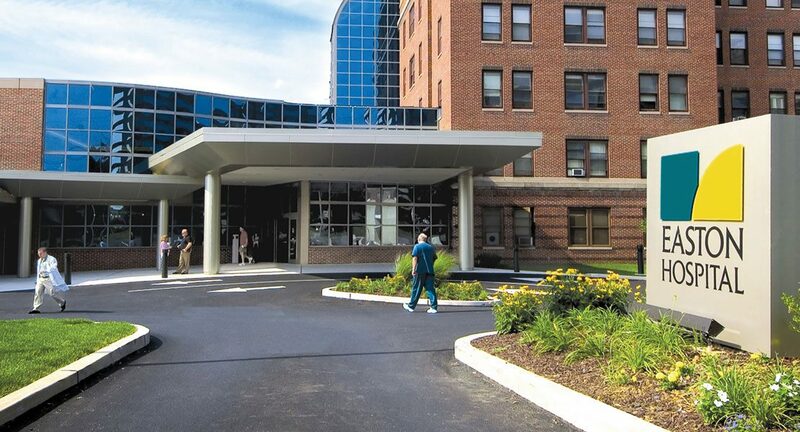 Today, Easton Hospital is a 238-bed facility with 43 medical specialties. It is accredited by the Joint Commission as a primary stroke center and total-hip and total-knee facility, and is the only hospital in the area designated as a Heart Attack Receiving Center. An additional 24 practice offices, four diagnostic centers and one community care clinic are also spread throughout the Lehigh Valley.